Landing on Water was released in July 1986. Neil Young would not collaborate with his usual companion David Briggs on this one but instead produced the songs together with Danny Kortchmar. In Landing on Water Neil Young once again searching for new sounds and expressions in his music. The outcome was an album that got rejected by the fans, got bad words from most critics and made the record company Geffen angry enough to sue the artist. Their reason for suing Young was because they consider him not being true to his own style and purposely made non-commercial products. The sound on Landing on Water is dominated by smattering drums (Steve Jordan) and a synthesizer which together creates a bombastic sound. 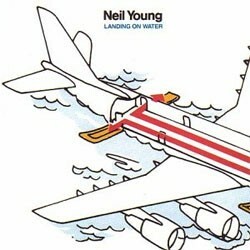 Neil didn’t sound as he was expected to once again, but it is also a fact that he was influenced by the changes in mainstream music taking place in the 80s – Landing on Water could not have been made in the 70s. “Landing on Water was an experiment. It has its high points and low points”, are Neil Young’s own words (from the book Shakey). Some of the high points are the atmospheric “Bad News Beat” and interesting “Drifter”. “Touch the Night” is somewhat anticipating “Rockin’ in the Free World”. But in most cases on this album, the songs are draining, like “People on the Street” and “Hard Luck Stories”. After a series of musical one-night stands, Neil Young is finally getting serious again. His previous three albums were just dalliances — in electronic (Trans), rockabilly (Everybody's Rockin') and country (Old Ways) music — none of which were terribly meaningful or deeply felt. This time, however, Young has committed himself to a sound that's truly new. Jim Farber was, however, one of few critics who recognized Landing on Water as a step in the right direction regarding Neil Young's career.